The country was called Northern Rhodesia when I was a schoolgirl, its first president as an independent nation was Kenneth Kaunda, and Unification missionaries had established a very successful sausage making factory there in the 1970’s. 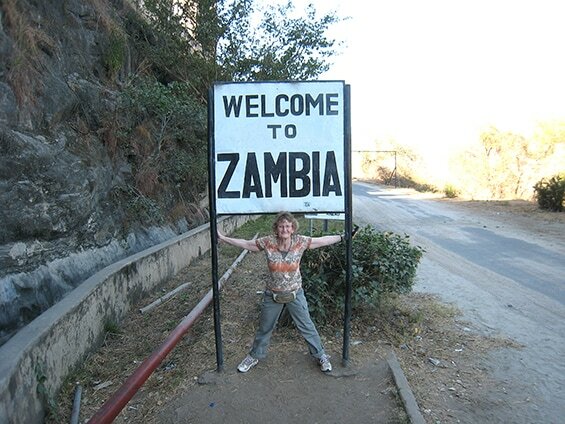 That was about the extent of my knowledge of the land-locked African country of Zambia before I joined an interfaith tour of the country in June 2013. Robert Williamson founder of and inspiration behind Sunrise Africa Relief, was born in Zambia, spent 17 years there as a missionary, and had been organising and leading tours under the sponsorship of IRFF (International relief Friendship Foundation) and UPF (Universal Peace Federation). The trips have a healthy balance of purpose; to distribute donations and funds, whilst gaining first hand feedback on how these donations are (to be) used; to visit institutions founded and funded by other organisations to see how they operate, and of course to see and experience this wonderful country which boasts the largest waterfall in the world, the Victoria Falls, ‘discovered’ by the missionary David Livingstone. 2013 marked the 200 anniversary of Livingstone’s birth in Blantyre, Scotland, and it was especially meaningful for me, born and raised in Glasgow and, like Livingstone, a graduate of Glasgow University medical school, to visit the land where he pioneered, worked and died. We were a small group of six ranging in ages from 24 to 61; four of us from a Christian/Unificationist background, and two Muslims. And our gracious van driver and ‘local’ guide was Rudolph, who went as a missionary to Zambia from Germany in 1975, later to be joined by his Austrian wife with whom he has raised four daughters. It was Rudolph who had learned the basics of sausage making from his Bavarian father, and who together with Robert and a Japanese missionary pioneered and developed a flourishing business which was able to support many other projects. One of the projects, started by the missionaries in 1984, Barlastone Park School, provides education to university entrance level for over 300 pupils. The school charges fees, but is dependent on donations and sponsorship for maintenance and expansion. Previous donations of microscopes and computers have been put to good use, and there are plans to build chemistry and physics laboratories. After handing over further donated laptops and school supplies, we were welcomed in the assembly room by the enthusiastic students who treated us to lively songs and dancing. At one time there was a well developed medical clinic, which for complicated reasons sadly could not be maintained. However, Eunice, one of the original nursing staff provides medical care to locals in a small makeshift clinic in her home. Her vision is to have official recognition and to expand her services, but the path towards that goal is fraught with challenges. Nevertheless she is a determined lady, and we were encouraged to see that she made immediate use of a modest donation by buying 100 chickens from which she can develop an income generating business to support the clinic. On behalf of the US based charity ‘Eyes on Africa’ we were able to distribute almost 200 pairs of reading glasses to local people who had been gathered by Eunice. In Ndola, northern Zambia is the Mackenzie School, a further project established by IRFF. Young people from Switzerland have regularly visited and volunteered their services, and make monthly donations to help pay teachers’ salaries. Another charity ‘Doors of Hope’ has also become involved, and we saw a building in which they plan to house a new medical clinic. Here we distributed ‘goodies’ to each child-a drink, chocolate, fruit and crisps-all eagerly received and consumed on the spot. In addition we donated school materials, largely funded by members of the Muslim community in Scotland. Again we were entertained to catchy singing and dancing, which moved us staid Europeans to sway to the beat. Although the resources of IRFF are small, the organization is always open to help where needed, as well as learning how other organizations operate, and so Robert had arranged for us to visit two projects new to IRFF-the Chimbuso project in Lusaka and the Namumu orphanage near Lake Kariba. Robert and Ashley also visited a third project in Livingstone, the Heartspring orphanage. The Chimbuso premises are humble but well organised, and self-sufficiency is encouraged. Here are housed women and orphans, and there is opportunity for schooling and to learn a trade. The small shop had an enticing assortment of items on sale, including laptop covers made out of recycled plastic bags. The impression left was very positive. But the visit to the ‘Namumu Orphanage Centre’ is indelible in my memory because of the extreme squalor in which the children are living. The roofs of the sleeping quarters are infested with bats; their smell persists even for years after they have been eliminated and is about as nauseating and irritating as anything I have experienced. And these kids sleep in such an environment… perhaps the difference is not so much the actual funding, but rather how well these funds are used and if they are channeled into productive activities which can generate at least a certain amount of self sufficiency. One of the most important aspects of this tour was follow up on the use of donations, because sadly corruption and misuse are not uncommon. On our schedule was an orphanage which had been visited and supported last year. Shortly before our arranged visit, we received a call informing us that the orphanage had been closed because of rent arrears, and that the children were being cared for in the homes of the staff. We were to meet in the office premises and to tour a new building which was to house the children. The whole situation seemed suspicious and the accounts given by the 5 or 6 representatives who received us were contradictory and implausible. However, the decision was made to give benefit of the doubt by making a small donation and tasking our on-the-spot representative Rudolph to make a visit later to see if the promised new orphanage materializes. But how painful it is to be (perhaps) deceived and lied to! This experience brought home to me of how important it is to ‘trust, but verify’. Zambia also has much to offer the tourist, and this aspect of our trip was not neglected. Luckily the roads in Zambia, although not four lane highways, allow for reasonably unproblematic travelling, and we were able to cover the several hundred kilometers from the Copper belt in Northern Zambia to Lake Victoria in the south in Rudolph’s van with minimal discomfort. But it is humbling to remember that it was under conditions of much more than minimal discomfort that the early pioneers such as David Livingstone travelled this route. We visited the monument in northern Zambia, which marks the spot where he died, kneeling in prayer at the age of 61 in 1873. His faithful servants removed his heart, which they buried there, and had his body transported to London for internment in Westminster Abbey. It was very moving for me as the seven of us, joined by two local boys, stood in prayer and reflection. Although ‘the white man’ in many ways has left a bloody and disgraceful legacy in Africa, many, such as Livingstone, came with noble intent and accomplished much. A most interesting and fitting conclusion to this visit was to be received by Chief Chitambo, a descendant of the local chief who worked with Livingstone. There is undoubtedly always protocol involved in an audience with dignitaries, and this was no exception. A full bow, removal of headgear, a prescribed method of clapping in response to his first questions-we more or less managed the ritual to the satisfaction of the chief and his henchman. Details of the audience will not be divulged, but before leaving, one of our group was offered a piece of land and at least one wife as an enticement to settle there! In eastern Zambia, Lake Kariba, the world’s largest artificial lake and reservoir was created when a dam was build over the Zambezi River in the late 1950’s. Before filling the lake the land was evacuated and burned, creating a rich lake bed environment for many fish and animal species. The kapenta is a sardine like fish which I was encouraged to sample. Served with nshima (made from maize or corn meal), one has a typical staple Zambian meal. My palate rebelled somewhat. It is definitely an acquired taste. The dam bridges the two countries of Zambia and Zimbabwe, (previously Northern and Southern Rhodesia respectively), and after minor border formalities, we were able to walk into Zimbabwe. The Victoria Falls in southern Zambia, is another crossing point between the two countries. This massive cascade is the world’s largest waterfall, and is especially spectacular just after the end of the rainy season, in April/May. The native name is ‘Mosi-on-Tunya’-the smoke that thunders-and indeed this is a fitting description as the spray can be seen from a distance of several miles. The better known name was given by Livingstone in honour of the British monarch, Queen Victoria, who was on the throne in the year that he discovered the falls, 1855. What a spectacular sight! Decked in double-layer raingear we viewed the Falls from different angles, ‘soaking in’ the experience. And then that evening we took a cruise on the Zambezi river, keeping a keen eye open for the native river inhabitants, and having the luck to see quite a few hippos and one or two well camouflaged crocodiles before we marvelled at the early sub-tropical sunset. And what visit to Africa would be complete with a visit to a game reserve? In a short afternoon visit we were able to see giraffes, elephants, monkeys, zebras and even the rare white rhinoceros. A close up view of the rhinoceros was made possible thanks to a relationship that Robert had cultivated on a previous trip with the park rangers who provided an armed accompaniment for us on a short bush walk to see this strange animal grazing. This two week visit made a deep impression on me and the lasting memories are of the people we met and with whom we shared testimonies, impressions and hopes. It was also largely because of this visit that I was inspired to volunteer at the Sunrise Africa Relief charity shop. Although the shop is no more, the charity continues and hopefully new and creative ways of fundraising can become established.